Here below is the official announcement of the Crew Battle versus ADHD. Process : join the private session 30 min before . Qualifying rules: You need to participate to one of the 3 days qualifying session at the minimum. IT IS THE RACE TIME that will be taken into account and NOT best lap time. If you want to give you more chance, you can participate to Max 3 qualifying session. Your best Race performance on each track will be kept. To be clear, let see the following table that I hope is easy to understand and will be easy to implement with data. 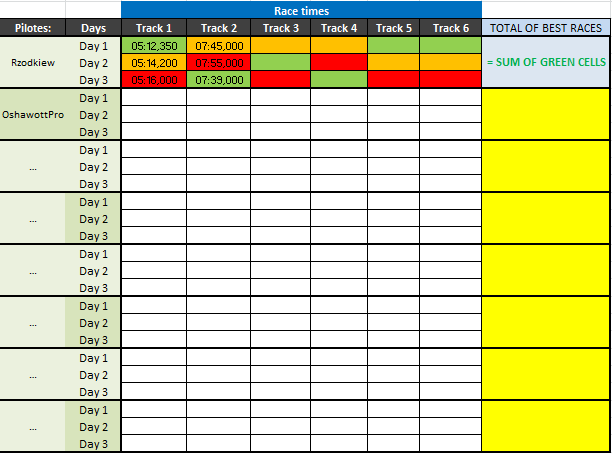 In this EXEMPLE green cells are the best race time of Rzodkiew on each track pending on the day. Red cell is worst time. Orange is a fruit. Everything is in your hands now! Not too much (don’t need you to be bored by these tracks) and share your experience with the crew! We are all together here! In order to have an idea of who is in, please answer to this topic saying you are in qualifying as we do for events.